Well, I have an hour before need to leave for the airport, and I haven’t packed my bags… No big deal, I will just forget something important. I will be 17 hours in total to-ing & fro-ing from airports, at three airports, and on the plane. The reward is Austin, Texas. Off I go to pack. Posted March 8th, 2006 by Ms. Jen & filed under fun stuff. 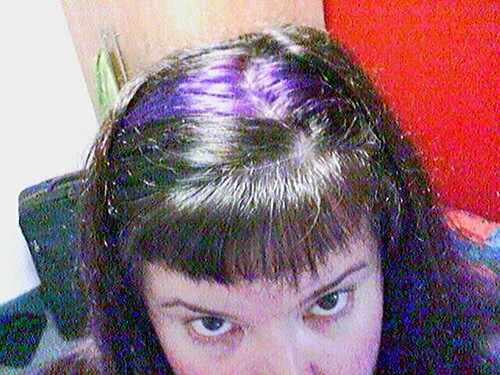 Wed 03/08/2006 10:25 – In a fit of pre-SXSW prep, I woke up at 6:30pm this morning to refresh the purple in my hair & do laundry. 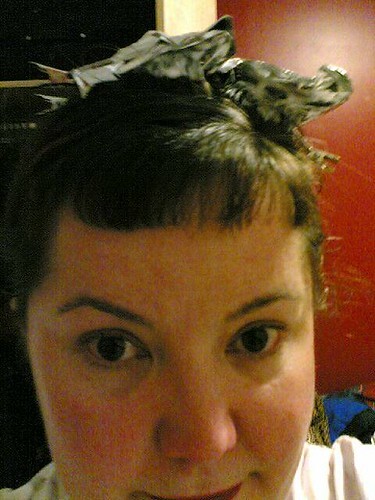 At Xmas time, I went to Ipso Facto to get my fave Deep Purple dye and they were out. In desperation, I went to Hot Topic at the Main Place Mall. Agh! Their Raw brand is medium purple and is strongly grape scented. 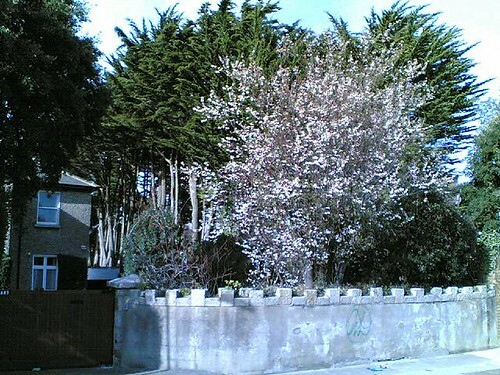 Posted March 6th, 2006 by Ms. Jen & filed under ah, ireland. The computer lab at the Trinity Collge MSCMM program has become an embattled segregated territory. Our computer lab is split in two with the “front” side that faces the Pearse Street station and a “back” side that faces a brick wall. The front lab has the newest and best-est computers and the back has all the people. Go figure. But more importantly, most of the men, who are also most of the programmers, are in the front lab, and most of the women, designers and artists, are in the back. I personally could care less, as I prefer to work at home on my laptop, but I tend towards the back of the lab as more of my various project group members are there and the front lab has a lot of glare in the afternoon as the window blinds are all jacked up. We were told at the beginning of the course by people who were in the course last year that folks would “settle” into a computer and it would be “theirs”. At the time, I thought, “That’s b.s.”. I still think, “That’s b.s.”. Only problem is that it is causing bad feelings with the folk who feel a certain computer is “theirs”. 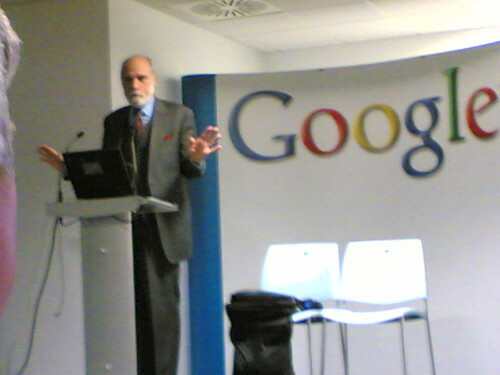 All the computers are run of the mill Dell desktops with a variety of audio – visual – web – image – etc programs on them. I like to sit down at whatever one is open and go to work. If I am working on a project, I like to sit next to my group members so that we can talk as we work, even if it is on things that are not project related, as we can build community and riff off each other. Well, Spring is back today. My jacket is unzipped, my gloves are in my pocket, and I feel well again, Thank God. In other news, it is in the 80s in Austin this week! Posted March 6th, 2006 by Ms. Jen & filed under fun stuff. Sun 03/05/2006 23:28 : More DIY hair dyeing in prep for SXSW. Mon Morning on the Luas – Three more days of the usual routine and the on Thursday I leave for SXSW Interactive! Happiness. Austin. Sun. Warmth. Geeks. Tacos. BBQ. Happiness. Posted March 4th, 2006 by Ms. Jen & filed under Uncategorized. 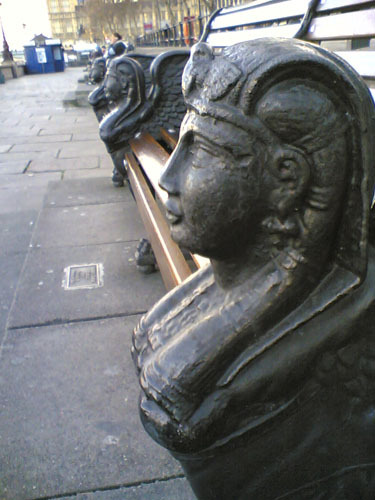 Thurs 02.09.06 – The sphinx benches along the Thames river embankment, London, UK. Posted March 3rd, 2006 by Ms. Jen & filed under Uncategorized. 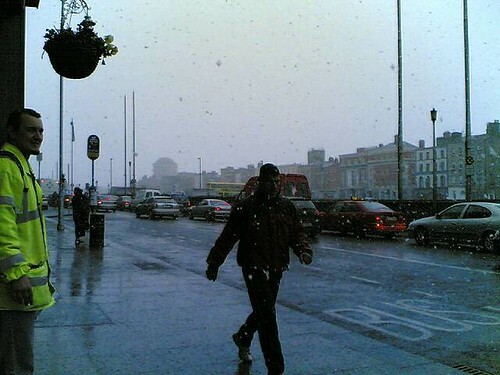 Fri 03/03/2006 16:19 – I walked out of my pre-SXSW haircut to find another fall-heavily-from-the-sky-for-10-mins-but-doesn’t-stick snow flurrie this afternoon and Dubliners ill prepared & scurrying in every direction. Dubs react to snow the way that SoCal folk react to rain – surprise, horror, & indignition.